Looking for a great restaurant in Crystal City? The trendy Northern Virginia neighborhood is a popular place to meet friends or business associates for lunch, happy hour or dinner. Here is a guide to the top restaurants in Crystal City, Virginia. Each of these restaurants offers something special. Check out their menus online and make a reservation. Crystal City is located in Arlington County, just south of downtown Washington, DC, between National Airport and U. S. Route 1. See a map. Jaleo - 2250 Crystal Drive. Crystal City, VA (703) 413-8181. 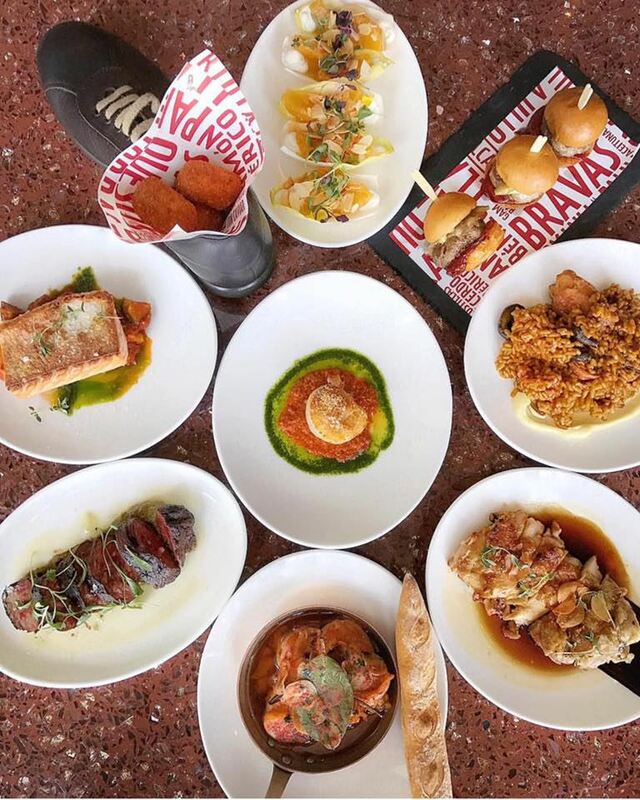 The restaurant, owned by the award-winning chef Jose Andres, is a local favorite. The menu features traditional Spanish tapas, as well as paellas, sangrias and a extensive selection of Spanish wines. The atmosphere is casual and fun. Other locations are in Washington DC and Bethesda, MD. Highline RxR - 2010 Crystal Drive. Crystal City, VA (703) 413-2337. This laidback bar specializes in craft beer with 40 brews on draft, but there's plenty here to eat too. Enjoy snacks like fried buttermilk chicken tenders, sweet potato tots and spinach dip, with larger items like flatbreads, burgers, and sandwiches. Fried doughnut balls and ice cream sandwiches round out the dessert menu. McCormick & Schmick’s Seafood Restaurant - 2010 Crystal Drive Crystal City, VA (703) 413-6400. With more than 80 locations around the U.S., the premier seafood restaurant features seasonally inspired dishes and regionally inspired preparations. The signature “Fresh List” is updated each week highlighting an impressive number of fresh seafood varieties. The menu also includes aged steaks, poultry, entrée salads and pasta. Ruth’s Chris Steak House - 2231 Crystal Drive. Crystal City, VA (703) 979-7275. The high-end steak restaurant features USDA Prime signature steaks as well as specialty items such as barbecued shrimp, lamb chops, stuffed chicken breast and fresh lobster. Freddie's Beach Bar & Grill - 555 South 23rd Street. Arlington, VA (703) 685-0555. Freddie's is a gay bar with great food and is open 7 nights a week until 2 a.m. There is Karoake nightly and a drag show on Saturdays. The menu includes salads, crab cakes, fajitas, sandwiches and burgers. San Antonio Bar & Grill - 1664 A Crystal Drive. Crystal City, VA (703) 415-0126. The restaurant features authentic Tex-Mex cuisine, from enchiladas and burritos to barbecue ribs and steaks. Additional locations are in Washington DC and Alexandria. Ted’s Montana Grill - 2200 Crystal Drive. Crystal City, VA (703) 416-8337. Ted's Montana Grill is a bison restaurant owned by business leader, philanthropist, environmentalist Ted Turner and restaurateur George McKerrow Jr. The menu features all-natural bison, certified Angus beef, as well as soups, salads, seafood and chicken dishes. The restaurant has several locations across the U.S., with another local one in Alexandria. The Portofino Restaurant - 526 South 23rd St. Arlington, VA (703) 979-8200. The family owned restaurant, established in 1970, offers fine Northern Italian cuisine in an elegant atmosphere. Kora Italian Restaurant - 2250 Crystal Dr. Crystal City, VA (571) 431-7090. The casual restaurant serves a blend of contemporary Italian food with a modern elegance. Happy Hours are Monday through Friday from 3:30 to 8:30 p.m. and Saturdays 5-8:30 p.m. Live jazz is performed on Friday evenings. Enjera Restaurant - 549 S. 23rd St. Arlington, VA. (703) 271-6040. The restaurant offers a mix of Ethiopian and Eritrean cuisine. The menu plays with traditional dishes from around the world and serves them with interesting and enticing flavors. Many vegetarian and vegan dishes are available.